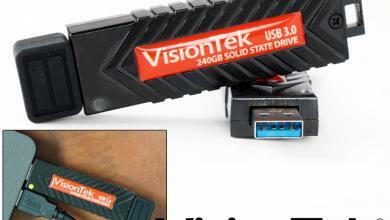 VisionTek Products LLC, (VisionTek®) http://www.visiontekproducts.com, a leading manufacturer of award-winning, high-performance upgrades and accessories for PCs and Macs®, announced the addition of new graphics cards models, complete cooling kits, and card/cooling kit bundles to its high-performance liquid cooled PC compatible CryoVenom™ line. Warranty. 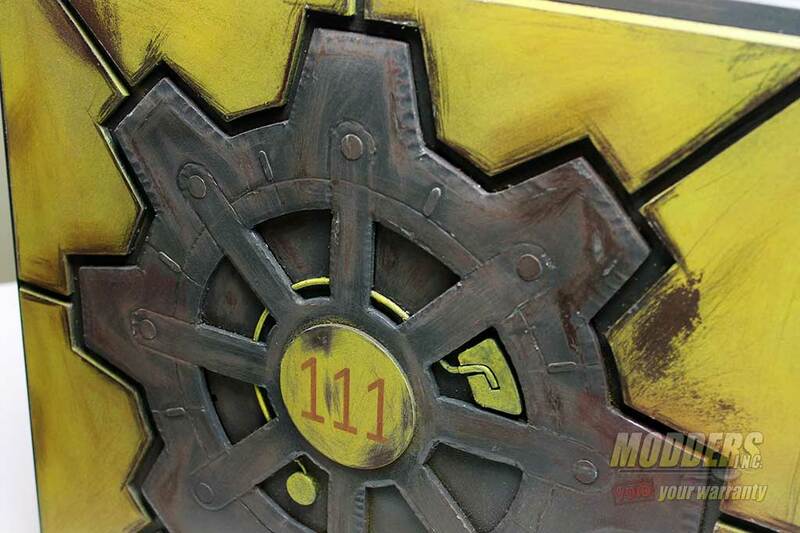 Modifications can void the warranty of a standard GPU. 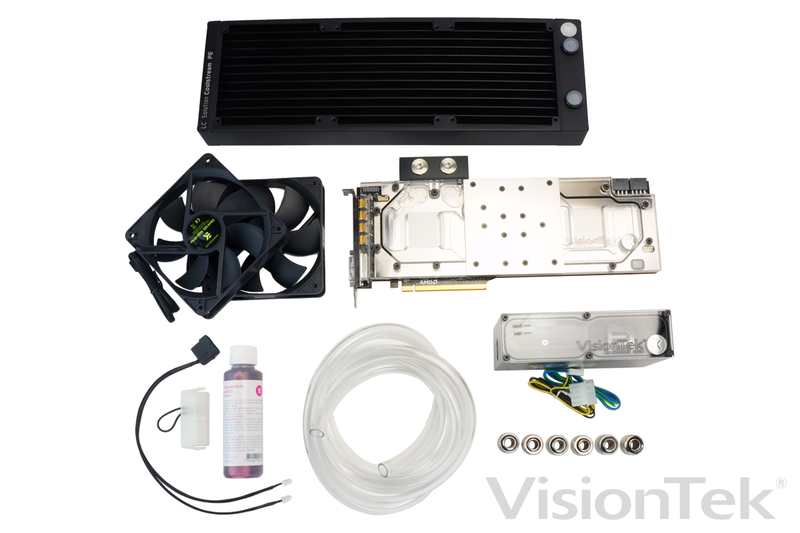 With a CryoVenom Liquid Cooling Kit, a system builder can still design and build a custom machine, yet enjoy the protection of a VisionTek warranty. Compatibility. Designed as a complete solution versus separately sourced components, certified-for-use kits are available for the VisionTek R9 290, 290X, and 295X2 graphics cards. Real World Use Tested. All components have been tested in actual use by the VisionTek Custom Shop team to ensure effective, high-performance liquid cooling. Ease of Installation. Everything is included – including pre-test and appearance convenience items – and were specifically designed to facilitate a quick, hassle-free install. At the heart of every CryoVenom Liquid Cooling Kit is a custom single 5.25” drive bay installable integrated pump/reservoir. This unique, two-in-one design eliminates the hassle of component sourcing and determining where to install them, as well as enables installation in a space limited chassis. The one-piece, industrial component quality pump/reservoir features an anti-vibration rubber mounting system for quiet operation, a 1000L/h high flow rate, and power management control of rotation speed through motherboard BIOS or a dedicated fan controller. 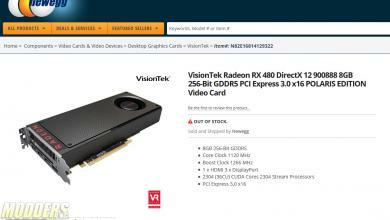 While the Radon 295X2 reference design graphics card has been proclaimed by industry experts as the fastest and most powerful graphics card available on the market, AMD partner VisionTek once again found ways to make the best card even better. In the stock closed cooling system configuration, the 295X2 uses two PCIe card slots and offers limited placement flexibility. By using a CryoVenom Liquid Cooling Kit, the 295X2 is transformed into a single slot card with better air flow for cooling running temperatures while now freeing up a PCIe slot. 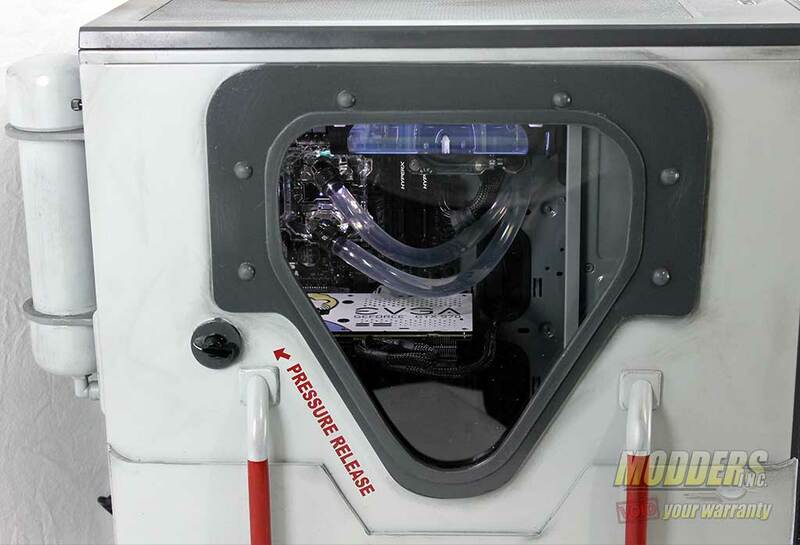 Because the CryoVenom pump and reservoir fit into a standard drive bay, placement challenges of the stock radiator and short length tubing are eliminated. 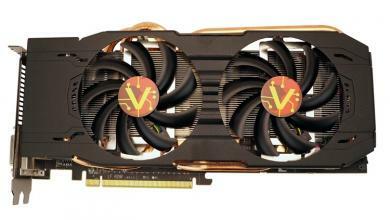 Lastly, the GPU, VRM, and memory on a CryoVenom 295X2 are cooled for longer, more reliable uselife. The stock 295X2 cooling system only cools the GPU. While market prices for the stock R9 295X2 range from $1500-$1950, the hand-built CryoVenom 295X2 is immediately available with a $1750 MSRP. Trying to build a comparable single slot, liquid cooled 295X2 would cost $1800-$2150 not including assembly time/effort, shipping time/cost, and likely would void the factory warranty. Complete CryoVenom 295X2 card and liquid cooling kit bundles are also immediately available starting at $2000 MSRP. 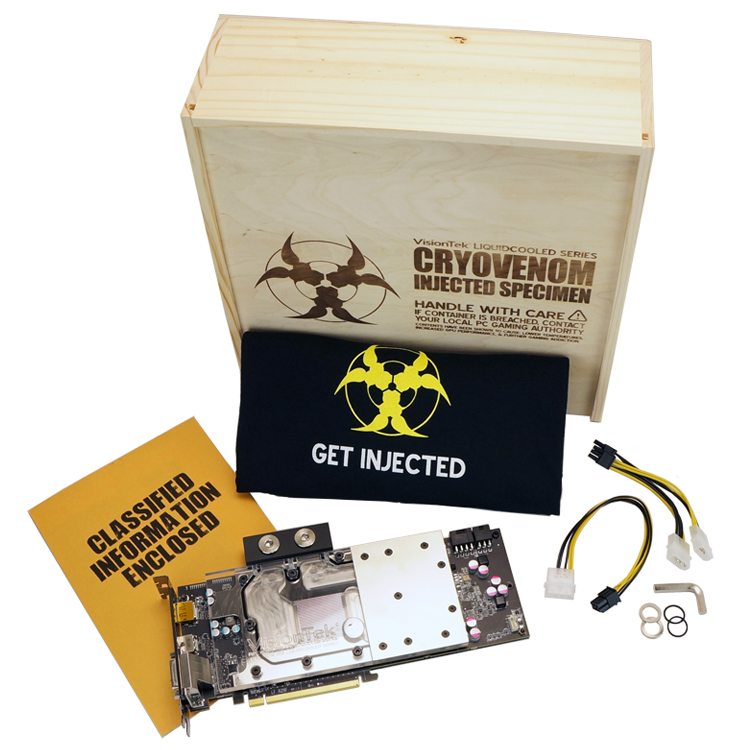 Whether a CryoVenom graphics card is add to an existing liquid cooled system, a CryoVenom liquid cooling kit is used with another brand of water block equipped graphics card, or a complete card and cooling kit bundle is desired, CryoVenom can be used to create the ultimate overclocked machine. 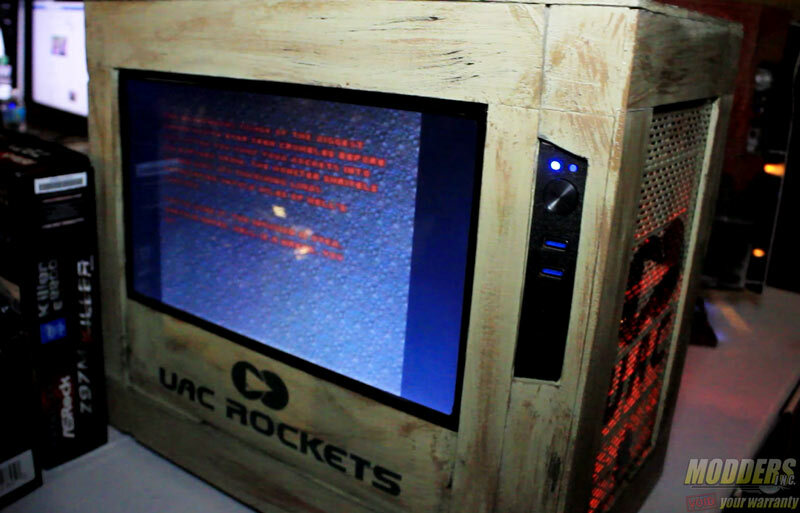 Hand-built and test certified by the VisionTek Custom Shop team to deliver up to 1175MHz GPU speed yet only experience an in-game peak temperature of 125 degrees F.
This limited edition version includes a custom designed t-shirt and wooden crate that’s ideal for the serious gamer to show off their style at a LAN event. 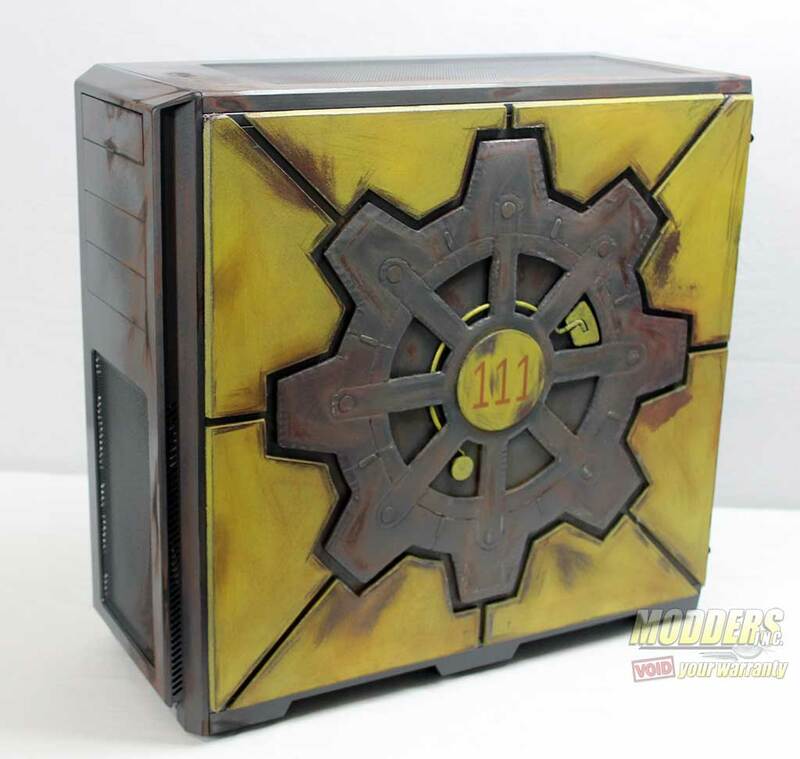 The ultimate single GPU liquid cooled graphics card. Runs cooler and installs easier than stock card while only using one PCIe card slot. Eliminate the hassle of sourcing your own components and determining where to install them. Includes pump/reservoir, best-in-class cooling capacity 240mm radiator, two fans, coolant, tubing, compression fittings, bridging pin, and LED lighting. 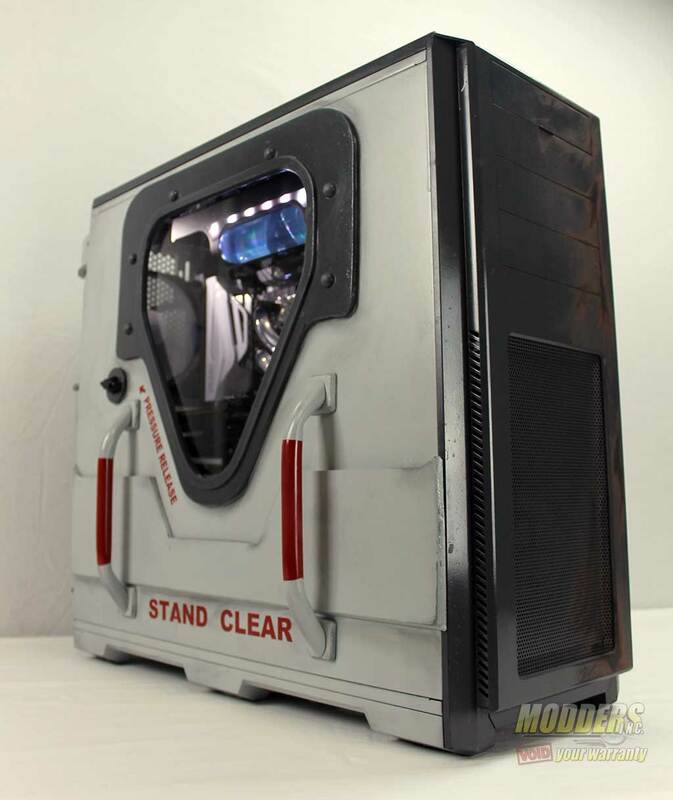 Includes pump/reservoir, best-in-class cooling capacity 360mm radiator, three fans, coolant, tubing, compression fittings, bridging pin, and LED lighting. Above kits are also available in Supremacy CPU water block dedicated liquid cooling configurations. 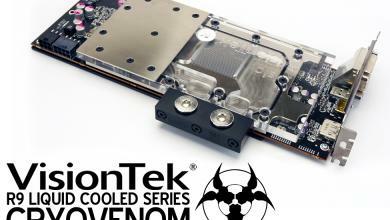 VisionTek recommends dedicating one liquid cooling kit per processor (GPU or CPU) for optimal performance and cooling.